SPACESHIP SIGHTINGS: Space shuttle Atlantis has docked to the International Space Station and the two spacecraft are now circling Earth together. The shuttle-ISS combo is very bright in the night sky. Check the Simple Satellite Tracker for flybys of your home town. Although the fireball appeared during the Leonid meteor shower, it was not a Leonid. Infrasound recordings of the blast suggest a small asteroid hitting Earth's atmosphere and exploding with an energy of 0.5 to 1 kiloton of TNT. Experts liken the event to the Park Forest fireball of 2003, which scattered dozens of meteorites across a suburb of Chicago. Meteorites are likely from this fireball as well. Stay tuned for developing information about the possible fall zone. "These curious clouds on the horizon caught my attention just before sunrise," says photographer Don Brown of Park City, Utah. "They were strangely bright relative to the rest of the sky." 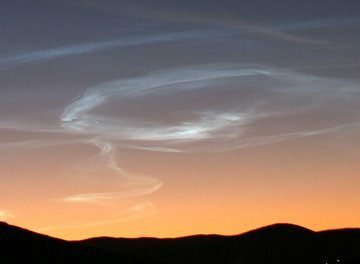 The cloud strongly resembles artificial noctilucent clouds formed at high altitudes by rocket and shuttle launches. Yet there was no (officially reported) rocket launch at dawn on Nov. 18th. Could the cloud be associated with the fireball? The geographical coincidence is certainly striking. Debris from the fireball should have dissipated by sunrise, but the cloud remains unexplained and a connection to the fireball cannot yet be dismissed. Readers, if you have more information about this event, let us know. On November 19, 2009 there were 1080 potentially hazardous asteroids.